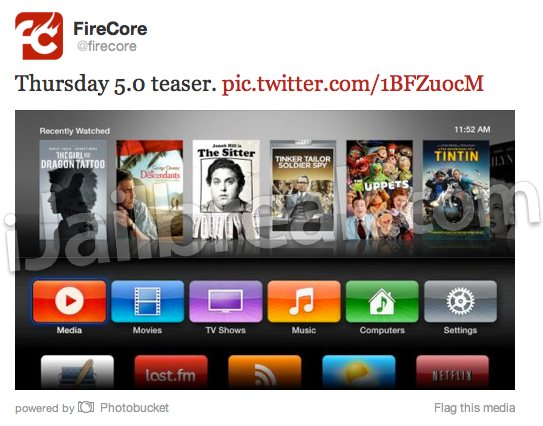 According to a recent tweet sent out by the FireCore Dev-Team yesterday they have made even more progress on aTV Flash (black) for the Apple TV 5.0 (iOS 5.1) firmware. The reason why this is significant is because Apple introduced a whole new GUI (graphical user interface) in the Apple TV 5.0 firmware update, and as such aTV Flash (black) needs to be re-worked to blend natively with the new interface. By the looks of the teaser image below you can see that things seem to be coming along nicely. Unfortunately there has not been anymore word on the status of the new 1080p Apple TV Jailbreak, but I am sure we will hear something in the near future. For those Apple TV 2G owners waiting for the Apple TV 5.0 firmware Jailbreak and aTV Flash (black) for the 5.0 firmware, this image at least gives you some reinforcement that FireCore is heading towards the public release market. I can’t wait either. I screwed myself and updated with out savung my SHSH blobs. Will Seasonpass have the jailbreak in time for the new aTVFlash? Crap hardware. Keeps disconnecting from my gig hardwired lan. Time to buy a dune. Will this work for the Apple TV 3G? Thank you Devs! We love you! !